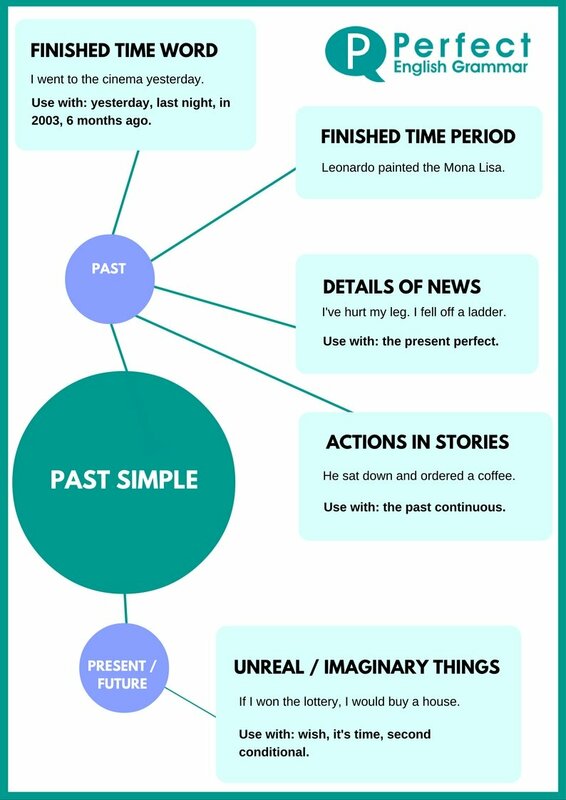 Read about how to make the past simple tense here. This is the basic past tense. We use it whenever we want to talk about the past and we don't have any special situation that means we should use the past perfect, present perfect or past continuous. Finished actions, states or habits in the past. 1: We use it with finished actions, states or habits in the past when we have a finished time word (yesterday, last week, at 2 o'clock, in 2003). We spent a lot of time in Japan in 2007. 2: We use it with finished actions, states or habits in the past when we know from general knowledge that the time period has finished. This includes when the person we are talking about is dead. Leonardo painted the Mona Lisa. 3: We use it with finished actions, states or habits in the past that we have introduced with the present perfect or another tense. This is sometimes called 'details of news'. I've hurt my leg. I fell off a ladder when I was painting my bedroom. I've been on holiday. I went to Spain and Portugal. 4: For stories or lists of events, we often use the past simple for the actions in the story and the past continuous for the background. He went to a café. People were chatting and music was playing. He sat down and ordered a coffee. Unreal or imaginary things in the present or future. 5: We use the past simple to talk about things that are not real in the present or future. So we use it with the second conditional and after words like 'wish'. Read about the difference between the past simple and the present perfect here. Try some exercises about the past simple here.